Thank you to the generous talents of Carrie @ West Virginia Red Reads we now have a button for the 2013 Challenge. Feel free to add this to your blog and use it when mentioning the challenge. Right click and download the small or big one. 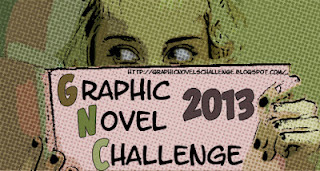 And here we come to the conclusion of our 2012 Graphic Novel Challenge! This is our month to catch up and finish off the challenge. So many of you are close! Congratulations to Jim for completing the challenge and then some! 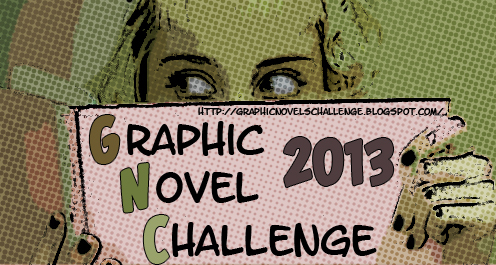 Next year, the challenge will run the same way with the basic challenge to read and review 12 graphic novels over the course of the year. However, I thought I'd mix it up and add some variety by adding themed challenges/levels as well. What I have planned will be a lot of fun and add some excitement but for those who don't like change the basic way we've always played will still be an option. I will also be changing one rule on how we keep track of how many books you've read. You'll be responsible for reporting in, rather than me keeping tally but more on that in January. For now, let's see how many can join the nine of us who have completed the 2012 Challenge by the end of the year. Are you up to it?? Nobody finished the challenge this month but a coulple of you are close. Tattoogirl joined this month and has risen to 7 books read & reviewed already. That's the way to do it! Some of our non-active members have got back into the game; keep up the reading, you still have two hole months to complete the challenge! Fall is full upon us here where I live. I've always found fall to be great for reading and this month we have an extra incentive for you keep reading Graphic Novels! 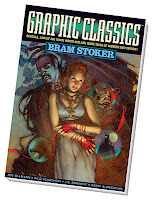 Courtesy of Tom Pomplun at Eureka Productions, the Graphic Classics Publisher has offered our group a PRIZE Pack of 3 Graphic Classic Volumes to 1 lucky winner this month!! The publisher is generous enough to open the Contest to all our members, making it an International Giveaway. How to enter the giveaway. You must be signed up as a paarticipant of this blog challenge. Enter a link to your review in the linky below as usual. Each link you enter will count as 1 entry to the giveaway. (ie. read and review 1 book this month = 1 entry into the contest; read and review 7 books this month = 7 entries into the contest). (N.B. My links (Nicola) will be listed below but, obviously, will be excluded from the choosing a random winner process. These are great books! I have Halloween in my hands and it looks spectacular, especially "The Cabinet of Dr. Caligari"! I reviewed Edgar Allan Poe here, and I have Bram Stoker on ILL at the library. As usual, record your October reads below: Remember each link equals one entry to the giveaway. Congratulations to John for completing the challenge last month! Please keep adding your reviews for the rest of the year. Welcome to a late joiner who is already climbing the ranks in October! Tatoogirl. August was a successful month for us, with lots of combined reading. Congratulations to Sandy for completing the challenge this month! John has quickly moved up the ranks from near the bottom to closing in on the finish line. Several people are moving steadily up in the ranks and, alas, we seem to have lost a few participants who are sitting at 1,2, or 3 books read & reviewed and not moving. As always we have a very eclectic mix of genres represented. I love the varied selection this group is representing! But we do seem to have a small Fables & Superheroes theme this month. I'm thrilled to see our first Asterix comic added to the list. Keep up the great reviews people! We are entering our last quarter of this years challenge.